Merv Friesen, of Lethbridge, passed away Friday, February 8, 2019 at the age of 64. Merv is survived by his loving wife Fran, his children Corey (Ophelia) of Nanaimo, Kyle (Sam) of Lethbridge, and Ali (Desi) of Lethbridge, his step children J.D. (Anne) Russell of Bozeman, Montana, Jeremy (Kylie) Hanson of Kansas, and Tiffany (Rodney) Hanson of Bozeman, Montana. His grandchildren Jasper, Taya, Zayden, Havana, Jimmy, Hunter, Mackenzie, Hadley, Devin and Ryker. He is also survived by his mother Thelma Friesen of Lethbridge, 2 brothers, Brian of Calgary and Bruce (Rae Lynne) of Lethbridge and two sisters, Sharon McNab of Lethbridge, and Linda (Scott) Fujita of Lethbridge, as well as his nieces and nephews Renae, Niki, Mike, Jessie, Robyn, Christen, Aleyna, Daycin and Berkley. Merv is also survived by his children’s mother, Cheryl Friesen. Merv was predeceased by his father Leonard Friesen, grandparents John and Helena Friesen and Alex and Helen Clarke, as well as uncles and aunts Cleon Friesen, Harvey Friesen, Udo Vegter, Bill Chrunik and Lillian Chrunik. Merv’s best friends Buddy and Wolfman passed away and for 10 plus years they were all inseparable. 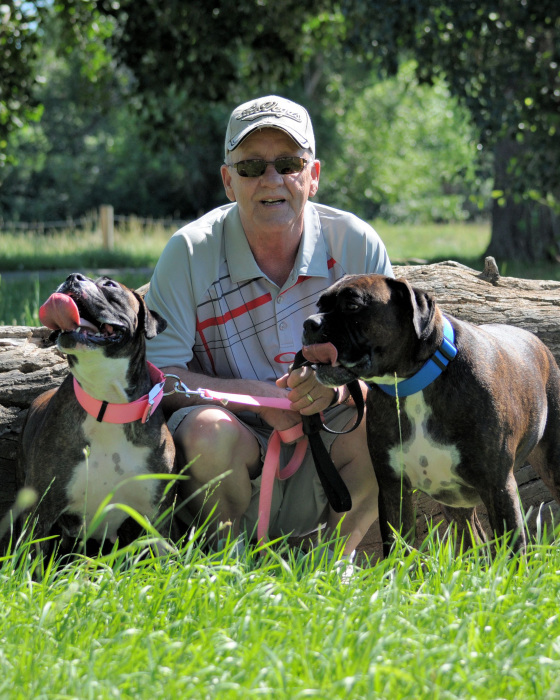 Merv will miss his latest pets, Kenya and Congo, a pair of registered boxers as well as their pup Tia. Merv was born in Fort Macleod, Alberta and lived there till 1995 when he relocated to Lethbridge. He worked at Triple M Housing over 28 years with his latest position as Sales Manager. He had a unique passion for his work. He enjoyed going to work every day. He also loved a 7-year Realtor career prior to Triple M with Century 21 and McNab Realty. Merv’s life was dedicated to his dogs and children he cherished so much. He served on the Recreation Board in Fort Macleod, President of Fort Macleod Minor Hockey for numerous years and President and co-founder of the Southwest “AA” Rockies hockey club. He also served as President of the Foothills, South Central and the Chinook Hockey leagues in Alberta. Coaching Little League and Minor Hockey teams was a passion he enjoyed so much for so many years. An avid volunteer, he was recognized for his efforts the year of the 1988 Calgary Olympics. He loved Men’s and Mixed slow pitch as well as playing recreational hockey many years. In June of 2000, he met Fran of Wichita, Kansas and they were married June 23rd of 2001, and they started their new life together in Canada. Despite his illnesses, he carried on with his witty humor, practical jokes, cruising in his Corvette and Trans Am, enjoying life to its fullest. A common quote from him was “Quality time is more important than Quantity time”. Merv was happiest when around his devoted pets and never lost interest in all that was happening in his children’s lives. He organized the continuing Friesen Reunion for nearly 21 years in honor of his grandmother Helena, whom he respected and admired. A Celebration of Merv’s life will be held at 2:00PM, on Saturday, February 16, 2019, at MARTIN BROTHERS RIVERVIEW CHAPEL, 610-4 Street South, Lethbridge, Alberta. For those who wish, memorial donations may be made to your local Cancer foundation.